Normally on this blog you hear about snakes as they attack sheep, eat dogs in front of their children owners or explode after trying to eat an alligator. 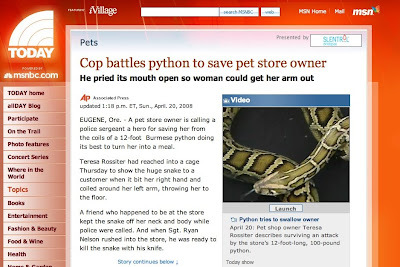 Today, we hear of a snake trying to kill the owner of the store in which it lives. WTF is this snake thinking? Snake, if you kill the woman who owns the store in which you live, who is going to feed you, after you finish digesting the storeowner? Who’s gonna drop frightened little mice in your cage for you to stalk and then eat? What do you think you’re gonna do, just slither out the door and go out and live a normal life? You’re a 100 pound, 12 foot snake! You think you’re just gonna leave the scene of the crime, shed your skin and that will be it? You’re lucky you weren’t shot by the policeman who showed up at the scene. Humans are not like the mice you usually eat- if you try and choke them, they can usually make it to their phone and call for help. As a matter of fact, most humans carry phones on them all the time. Also, if you do eat a human, unlike with mice, another human will find you and kill you- you may think- “how? I can take a human any day of the week.” Well snake, humans have guns. They don’t even need to be near you to kill you.